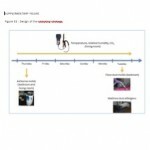 Recent Built Environment Microbiology papers, July 6, 2015 – microBEnet: the microbiology of the Built Environment network. Several new papers about microbes and the built environment came out or came up in my searches this weekend, so time for another installment. Since one of the papers is about prison workers, you could play Johnny Cash’s Folsom Prison Blues while reading this post. Responding to a request by corrections agency management, we investigated coccidioidomycosis in prison employees in central California, a coccidioidomycosis-endemic area. We identified 103 cases of coccidioidomycosis that occurred over 4.5 years. As a result, we recommended training and other steps to reduce dust exposure among employees and thus potential exposure to Coccidioides. ….. We .. could not determine if each confirmed coccidioidomycosis case in an employee was because of exposure at work or outside of work….Almost all interviewed employees at each prison reported spending time outdoors at work, and almost one third, specifically custody and plant operations employees, reported work involving soil disruption. 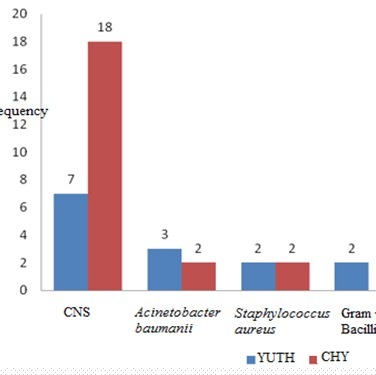 The aim of this study was to identify potential bacteria reservoirs that may be responsible for nosocomial infection in surgical services in the YaoundÃ© University Teaching Hospital (YUTH) and the Central Hospital YaoundÃ© (CHY)…..a total of 143 surface samples were collected. Bacteria were isolated in all surfaces except from one trolley sample and a surgical cabinet sample. The predominant species in all services was coagulase negative Staphylococcus (CNS). The average number of colonies was132. 82CFU/25cm2. The bacteria isolated in the air were similar to those isolated from surfaces. From the 16 water samples cultured, an average of 50.93 CFU/100ml bacteria were isolated. The distribution of isolated species showed a predominance of Burkholderia cepacia. 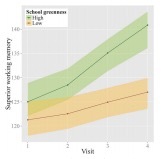 Paid Access: Green spaces and cognitive development in primary schoolchildren – Payam Dadvand – PNAS. This is not a microbiology paper, but interesting enough to include here. This study aimed to assess the association between exposure to green space and measures of cognitive development in primary schoolchildren. This study was based on 2,593 schoolchildren in the second to fourth grades (7—10 y) of 36 primary schools in Barcelona, Spain (2012—2013)….We assessed exposure to green space by characterizing outdoor surrounding greenness at home and school and during commuting by using high-resolution (5 m Ã— 5 m) satellite data on greenness (normalized difference vegetation index). Multilevel modeling was used to estimate the associations between green spaces and cognitive development….Our study showed a beneficial association between exposure to green space and cognitive development among schoolchildren that was partly mediated by reduction in exposure to air pollution. This study aimed at understanding the extent of contamination by lactic acid bacteria (LAB) and yeasts from the house microbiotas during sourdough back-slopping. Besides sourdoughs, wall, air, storage box, dough mixer and flour of four bakeries were analyzed. Based on plate counts, LAB and yeasts dominated the house microbiota. Based on high throughput sequencing of the 16S rRNA genes, flour harbored the highest number of Firmicutes, but only few of them adapted to storage box, dough mixer and sourdough. Lactobacillus sanfranciscensis showed the highest abundance in dough mixer and sourdoughs. Lactobacillus plantarum persisted only in storage box, dough mixer and sourdough of two bakeries. Weissella cibaria also showed higher adaptability in sourdough than in bakery equipment, suggesting that flour is the main origin of this species. Based on 18S rRNA data, Saccharomyces cerevisiae was the dominant yeast in house and sourdough microbiotas, excepted one bakery dominated by Kazachstania exigua. 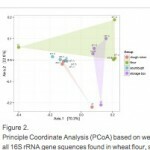 The results of this study suggest that the dominat species of sourdough LAB and yeast dominated also the house microbiota. 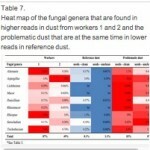 The aim of this paper is to gain knowledge on the bacterial and fungal communities in dust causing organic dust toxic syndrome (ODTS) and in reference dust not causing ODTS. Bacterial and fungal communities were described in personal exposure samples from grass seed workers developing ODTS, in dust generated from grass seeds causing ODTS and in dust generated from reference seeds not causing ODTS. … After only a few hours of unloading and cleaning of the lot of problematic grass seeds workers began to experience airway symptoms and flu-like symptoms along with malaise. … The sequencing data revealed more than 150 bacterial and 25 fungal genera present in each sample. Streptomyces spp., Aspergillus fumigatus and Rhizopus microsporus were dominating in the dust causing ODTS but not in the reference dust. Paid Access, but you can request full text at Research Gate: Concentration and determinants of molds and allergens in indoor air and house dust of French dwellings – Arnaud Dallongeville – Science of the Total Environment. Note: Supplementary materials 1 and 2 appear to have been switched. 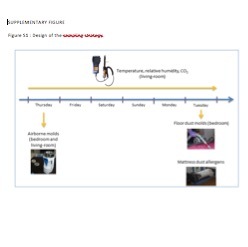 The aims of this study were to assess the concentrations of common molds in indoor air and floor dust and the concentrations of house dust mite, cat and dog allergens in mattress dust in French dwellings, and to assess predictors of these concentrations. A sample of 150 houses in Brittany (western France) was investigated. … Multivariate linear models for mold levels, explaining up to 62% of the variability, showed an influence of the season, of the age of the dwelling, of aeration habits, presence of pets, smoking, signals of dampness, temperature and relative humidity. Allergens in the dust of the mattress were strongly related to the presence of pets and cleaning practices of bedsheets, these factors accounting for 60% of the variability. This study highlights ubiquitous contamination by molds and underlines complex interaction between outdoor and indoor sources and factors. This Bacteria-Slaying Light Fixture Is Perfectly Safe For Humans – Andrew Liszewski – Gizmodo. Note: I wonder what effect this would have on the normal skin microbiome of healthcare workers and patients. I am not sure if the qualification “safe for patients or caregivers” is really true if you take the effects of the light on our skin symbionts into account. Bacteria-killing ultraviolet lights can sterilize everything from toothbrushes to bedsheets. But a new type of light fixture called the Indigo-Clean is able to wipe out those same dangerous pathogens while still being safe for patients or caregivers in a hospital. … To anyone in the room, the HINS light looks blueish in color, which might be slightly annoying for those who prefer warmer hues. But it’s more than just an issue of preferable color temperature for bacteria and other harmful micro-organisms lurking in the room. The HINS light is absorbed by molecules inside them which starts a chemical chain reaction that stops their growth, prevents reproduction, and eventually kills them.